N.B. This was published last year in a local magazine called Apsara (the photos in this post are not necessarily the same as those in the magazine). I thought it might make a good 1st anniversary post for my blog, so I’ve been saving it up for a while :). I haven’t managed to post as frequently as I’ve wanted to, largely because I am very choosy about what I want to write about. I have managed to put about about 38 posts in the past year, I only missed posting in November 2010 and January this year. I’ve had over 3,000 unique views since I started (not brilliant, but not terrible). I hope I can stay motivated and keep it going. For all my regular viewers and commenters, thank you. On the still, calm waters of the Potaro River we began the final river bound leg of our journey upstream to the raging torrent of the Kaieteur Falls, the second day into our voyage overland to Kaieteur. We had left Diamond on the East Bank at 6 a.m. on the previous day to journey over the roads to Pamela’s Landing, in the minibus of Ian. Frank Singh of Rainforest Tours organised our trip and made sure we were never, advertently or inadvertently, dependent for our survival on the care of any lunatics or persons otherwise of unsound mind. For some period during the ride in Ian’s minibus we were not sure Frank had been entirely successful in keeping us out of the hands of lunatics, but we soon realised that Ian was an experienced and careful (though speedy) driver, and raconteur of tales ribald and and pure, like the one about a man who was living in Georgetown since “big market clock was a watch”. Uncle Bayney (left) and Ian discuss Big Market "watch". Having experienced much rain and mud on what are charitably called roadways in Guyana’s interior we finally arrived at what, for me, was the real beginning of our journey; the boat waiting on the Potaro River at Pamela’s Landing. Andre Lam, fellow photographer and traveler, and I demanded the best seats at the bow of our water chariot, a 15 foot wooden boat, with a leak from the bottom that absolutely did not in any way resemble a geyser. To draw any such comparison would be pure hyperbole. We drew out into the calm, glassy water of the Potaro. A photographer’s delight of subtle and varied reflections of the sky and forest that caused the spontaneous triggering of the shutters of both Andre’s and my cameras, before we even knew what we’d done. What we both captured pales by comparison to reality. It is the solemn duty of all who have the means and wish call themselves true Guyanese, to make this pilgrimage. If you do not, you may claim love of your country in your heart, but you will never know the awe of your country that you should. After spending more than 1 hour, but less than 2 hours (the official method of measuring time in the bush) we arrived near Amatuk Falls. Once again there was a spontaneous release of shutters both Nikon and Pentax, before conscious thought stumbled up. But here were we, at our first day’s destination and one of the visual wonders of our trip and here was my cousin Kevin without a single available exposure on his memory card. Kevin, in a fit of typical teenage efficiency had forgotten to offload his only memory card’s worth of valuable memories before coming on the trip. Again with typical teenage conformity Kevin’s camera used a proprietary memory type different from anyone else’s. At Amatuk, an island perched in the middle of the impressive cascade of the falls, we set up camp and got our first taste of the pot of the gentleman would would be our chief cook and bottle washer (and tour guide) Tony. Tony was a toshao (chief of an Amerindian community), is Frank’s right hand man, is a protector of bumbling photographers, is a raconteur extraordinary, is our Chief Medical Officer and was quite possibly a Swiss Army knife in a former existence (he truly is a jack of all trades). Having only been introduced to Tony the day before we were not sure we could trust our continued corporeal existence to him, but it did not take long for him to gain our complete confidence. Keeping the river where it belongs. Tony chats unconcernedly on the right. I must say though, I was very disgruntled at the fact that in my moment of need, he resolutely refused to fetch me up the mountain on his back. How unreasonable could he be? Could carrying 200 pounds of teary, blubbering, unfit, photographer up a mountain be too much to ask? I think not! Be warned, if you ever happen to become a 200 pound, blubbery, unfit, photographer and seek the advice your uncle (who last ascended to Kaieteur via the Oh Meh Gaad 1 and Oh Meh Gaad 2 trails, 17 years in the past) who tells you that it is “easy”; I advise you to seek a second opinion, preferably not from your other uncle who also did the climb 17 years ago. And definitely avoid asking Tony, who is just looking for another anecdote with which to regale the next bunch of victims tourists. A word of warning regarding the Oh Meh Gaad 1™ and Oh Meh Gaad 2™ sections of the trail: You are not permitted to push over the edge (or otherwise brutally end the existence of) your friend or cousin who are skipping gleefully and daintily up the almost impassible trails while you breathlessly lumber behind. No matter how sorely you are tempted. Don’t do it. Having said all that, the scenery around us on the trail was awesome. Not the “awesome” that has become the synonym of “nice” but the “awesome” which means causing feelings of awe. In fact, all that caused Andre’s life to be spared on that walk up the mountain was because only he had the energy to take pictures and if I’d pushed him off the mountain there would be no pictures of the climb. Plus he had to carry my camera, I couldn’t manage to carry it myself. I feel no shame; evidently the Prozac has worked. On a final note; we spent 2 nights at the top of the plateau. 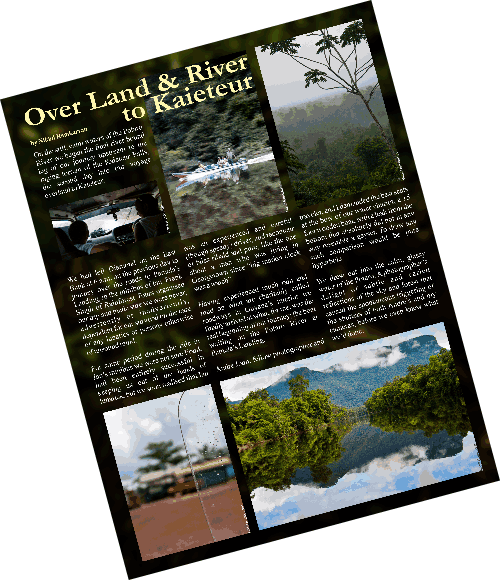 I’ve traveled to Kaieteur Falls several times by plane and spent my allotted 2 hours (half of which is spent merely walking to the falls from the airstrip) viewing the falls. I’ve always thought, having exclaimed at the wonder of it all on every viewing, that I’d had the “Kaieteur” experience. I thought this trip would merely give me the time to take the photographs I’d always wanted to, but never had. I was mistaken. I now see that spending 2 days here merely makes it clear that 2 days is not enough. Not enough for taking pictures, not enough for experiencing the falls. After I’ve had an opportunity to spend a week there, I will let you know if a week is enough. I doubt it will be. Hmm, I wonder when Frank has another tour climbing the mountain. P.S. I took several hundred photos of which 54 made my cut and fewer yet, the magazine. If you are interested in seeing the rest of them (apart from the posted photos here and the slideshow below) go check them out on my website. They are worth your time. Andre’s photos, all 157! of them are here. You have a way with words and this article is nicely written, funny, glib but giving a good idea what it might be like to make the trip (without scaring me away from ever thinking about it), and of, course, the photos are awesome! Hi Nikhil. You are a great story teller. I enjoyed reading the story. Truly an adventure. Tell us more. Add the part from Amatuk to Tukeit and so on….. I thoroughly enjoyed reading this! I’d planned to visit Kaieteur Falls and have tried to find out what is the best way to go there. The hike had seemed tempting but I’ve got to get fit in order to make it up. Planning a trip later this year (Dec), and hopefully I get there!